Albert-Laszlo Barabasi is a pioneer of real-world network theory and author of the bestseller, "Linked: How Everything is Connected to Everything Else and What It Means for Business, Science, and Everyday Life." At 32, he was the youngest professor to be named the Emil T. Hofmann Professor of Physics at the University of Notre Dame and has won numerous awards for his work, including the FEBS Anniversary Prize for Systems Biology and the John von Neumann Medal for outstanding achievements. He currently lives in Boston and is Distinguished Professor and Director of the Center for Network Science at Northeastern University. "In Linked, Barabasi showed us how complex networks unfold in space. In Bursts, he shows us how they unfold in time. Your life may look random to you, but everything from your visits to a web page to your visits to the doctor are predictable, and happen in bursts." "Barabasi is one of the few people in the world who understand the deep structure of empirical reality." "Barabßsi brings a physicist's penetrating eye to a sweeping range of human activities, from migration to web browsing, from wars to billionaires, from illnesses to letter writing, from the Department of Homeland Security to the Conclave of Cardinals. Barabßsi shows how a pattern of bursts appears in what has long seemed a random mess. 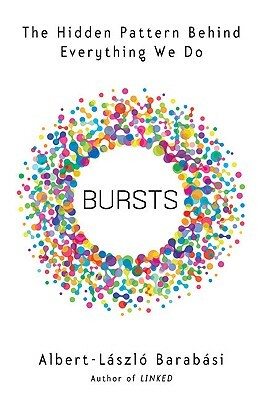 These bursts are both mathematically predictable and beautiful. What a joy it is to read him. You feel like you have emerged to see a new vista that, while it had always been there, you had just never seen." "Bursts is a rich, rewarding read that illuminates a cutting-edge topic: the patterns of human mobility in an era of total surveillance. The narrative structure of Barabßsi's provocative book mimics the very pattern of bursts, as abrupt jumps through the lives of a post-modern sculptor, a medieval Hungarian revolutionist, and Albert Einstein eventually converge on a single theme: that our unthinking behaviors are governed by a deeper meaning that can only be deciphered through the brave lens of mathematics." "Barbasi, a distinguished scientist of complex networks, bravely tests his innovative theories on some historic events, including a sixteenth-century Crusade that went terribly wrong. Whether or not the concept of "burstiness" is the key to unlocking human behavior, it is nonetheless a fascinating new way to think about some very old questions."